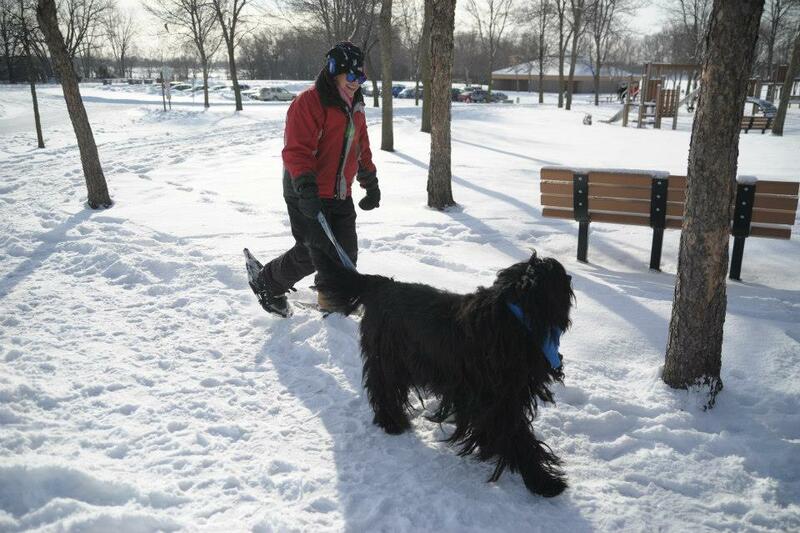 Nearly 250 snowshoers toed the start of the 2014 Twin Cities Snowshoe Shuffle, an annual trek in the woods, frozen lake and meandering meadows of the Long Lake Regional Park, New Brighton, in Minnesota’s largest race. The course cruises 10 km around and on Rush Lake, crossing railroad tracks twice each loop and then parallels them on the northern-most part of the park. Three managed to cover the 10 km national qualifier route under the one-hour buck, led by overall winner and fleet-a-foot Josh Jorde, 38, whose 8:59 pace yielded a 55:47.33 win. 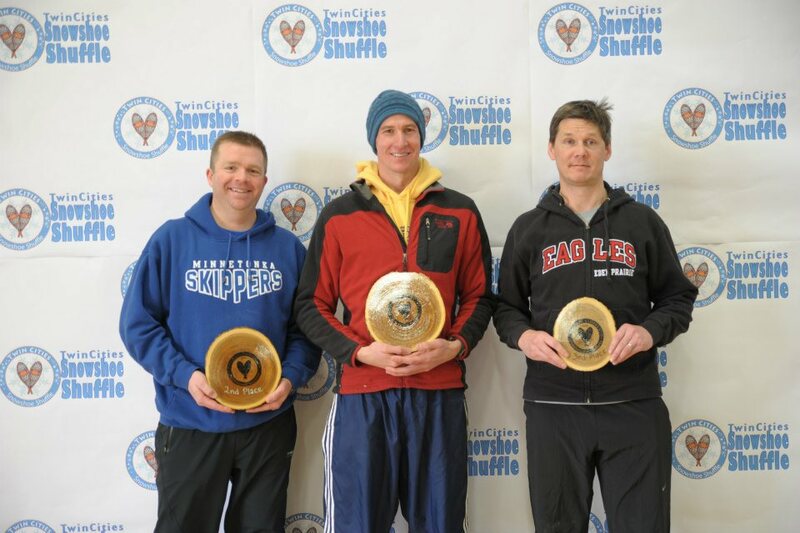 At the Boulder Lake Qualifier in January, Duluth, battling a championship field including Eric Hartmark and Kelly Mortenson, Jorde secured a hard-fought fifth. At TCSS, 65 seconds later Paul Giannobile crossed for the overall silver, providing motivation and pride for all senior-master racers. Giannobile worked with Team USA Minnesota to improve his own running through their long-distance development group. Colin Gardner-Springer bronzed the snow in 58:34. Each led their individual age group. Erik Thompson finished the first four across the line in 1:03. Katy Class took her class victory in 1:14. 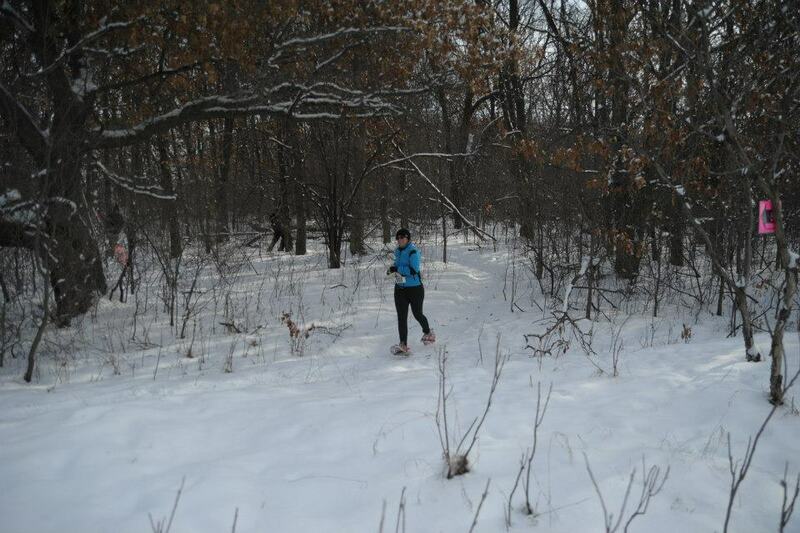 Winteriffic’s Pam Ogden finished in 1:32, taking second for the class while Kate Poucher crossed in 1:49. 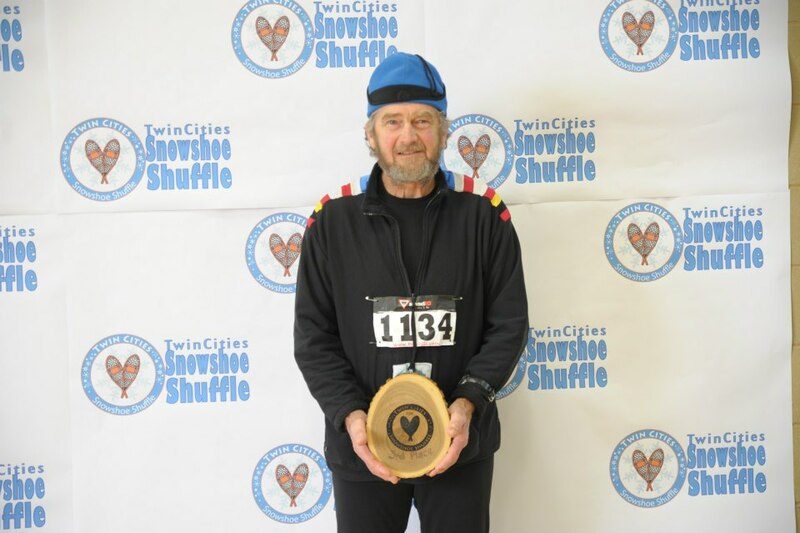 Dean of Minneapolis snowshoers, Ed Rousseau, 74, finished in a resounding 1:30. He noted, “This was my fastest snowshoe race in three years, a very good best-yet qualifying time for the (USSSA Dion National Championships) in my Masters Division. 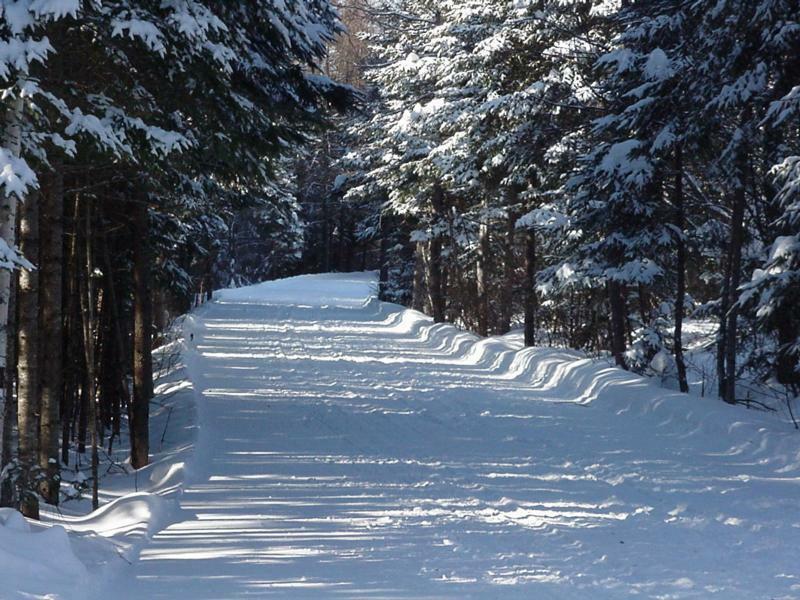 So (after the race), I made arrangements for Bennington, VT from February 28 thru March 2.” He trains with shoe and snowshoe runs, mixing them up every other day. Notably he trains with “big wooden snowshoes and boots for my training runs. They’re great muscle and cardio toners.” Note to self: dig out the woodies from the garage . . . .
Bob Durband pushed out a 16:42 pace for second behind Rousseau. Durband and I reminisced at Winteriffic about the last Vermont nationals, held in 2006, raced on wet, heavy snow. This year’s appears like a possible deep-snow fest. Glory Kibble deserves special recognition as she crossed the finish as the last person in on the 10 km course, but first in the hearts of everyone there. Ahead of her by a few minutes include Marilee Maxwell, then Erin MacLennan, Nikki Hardy and Mitzi Curtis who just ticked over the two-hour mark. The 5 km class crowded the course with over 200 racers. The course skips the back-half of the 10 km course. The group did not slow teenager, Garrett Williams , who won the Minnesota State Snowshoe Junior Championship going away in 30:19. He is a Sophomore at Cooper High School, a competitor in the cross-country running program. Sam Kessler, 17, also a Cooper cross-country runner and friend with Williams, managed the silver overall while Jesse Daun nailed a 33:00. Daun, featured in a stand-up paddle-surfing article, races marathons and bees, too (! ), as he is a bee-keeper. Mr. Fleet-a-Foot, Tim Zbikowski, 61, won his class while edging Geoff Herman at the line by 13 seconds; Herman did just fine, capturing his class gold. Zbikowski owns and manages the CuteMoose website (along with Carol Klitzke) featuring all things snowshoe related and any excuse for more Moose. The women’s overall win found Cheryl Laudenback finishing first in 40:19, just edging Adam Johnson for the 11th overall. Laudenback, a New Brighton resident, is very familiar with this course and race. Tina Welzien gave chase in a 40:42 effort, securing silver overall. 15 seconds later, in cruised Tara Konat followed by Melanie Bourke and Ruby Hocker. 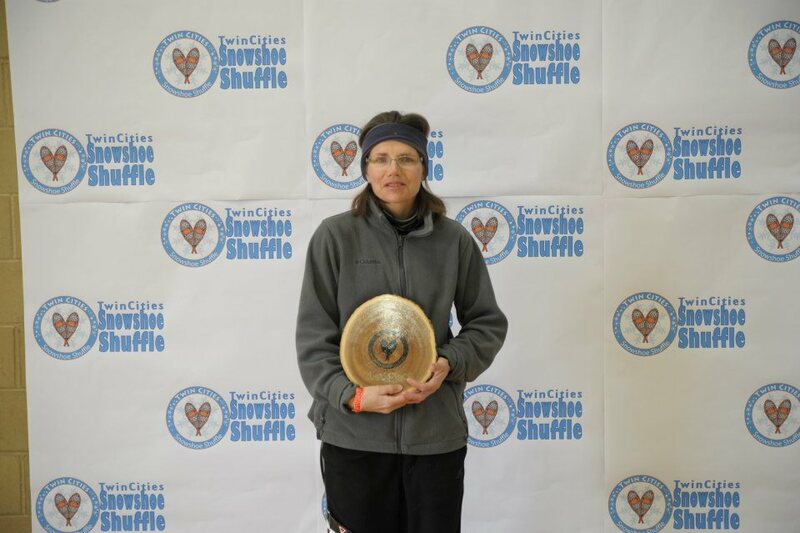 Long-time racer at TCSS, Carol Klitzke took silver in her class with a 54:57 finish. Credit goes to Charlotte Twocrow who wrapped up the day for the 5 km race in 2:23. Leading her in raced Laura Pederson, then Julia Laden, Susan Tornblom, Jessa Howes, Beth Thornton, Carrie Getzmier, Ruqiya Jama, Rachel Tushaus, Sarah Steele, Noreen Hale, and Jen Johnson as women snowshoers outnumbered the men this day by two-to-one. The title of this article could well have been: Girl’s Day at the Snowshoe Races. New this year is the Homewood Suites by Hilton offering special rooms for those visiting or wanting to have accommodations near the race . . . the site is only a mile away. 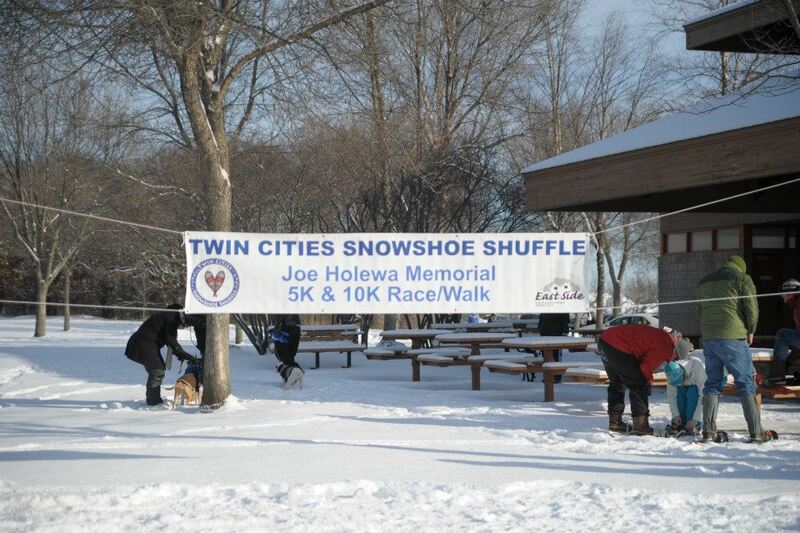 This race honors Joe Holewa who co-founded its existence; his desire grew from a lifetime of snowshoeing, leading to a life of 87 years. 25-year-old Joe Holewa completed the 5 km in 56:55. 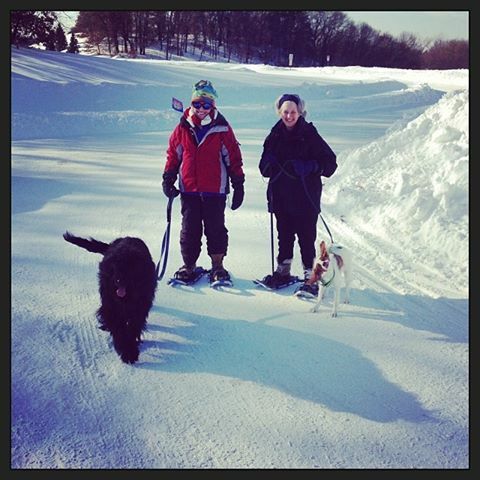 There is an introductory kids race along with the by-big-demand snowshoe with your dog race. Dog racers also get a goody-bag with specialized dog items; snazzy! This popular class has grown annually. My wife wanted to race this one, but I was unable to get the collar comfortable around my neck. 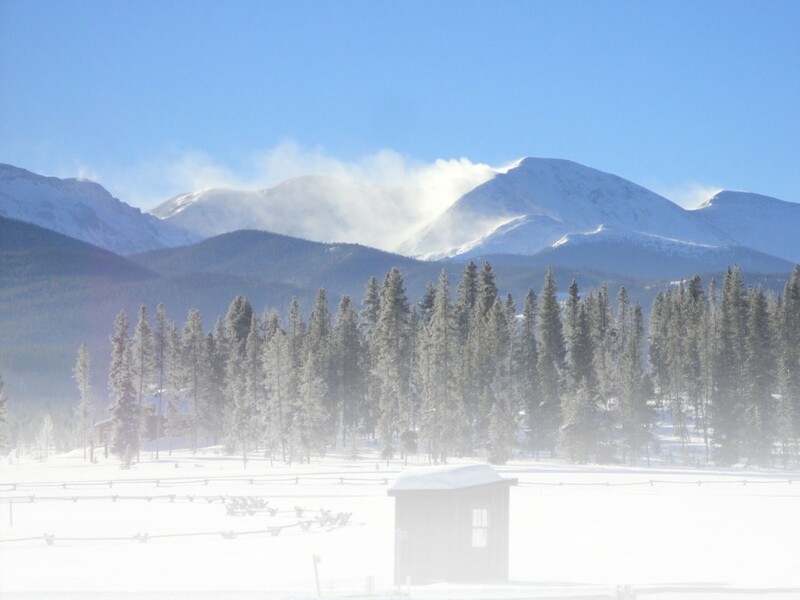 The 2015 event will celebrate Snowshoe Shuffle’s tenth anniversary; be there. And don’t forget the dog. This entry was posted in Features, Homepage Featured, Snowshoe Racing and tagged Boulder Lake, Braveheart Snowshoe, Cute Moose, Dion, dogs, Eric Martmark, ESNS, Homewood Suites, Joe Holewa, Kelly Mortenson, Long Lake Park, Minnesota, New Brighton, Snowshoe, snowshoe shuffle, USSSA by Phillip Gary Smith. Bookmark the permalink.